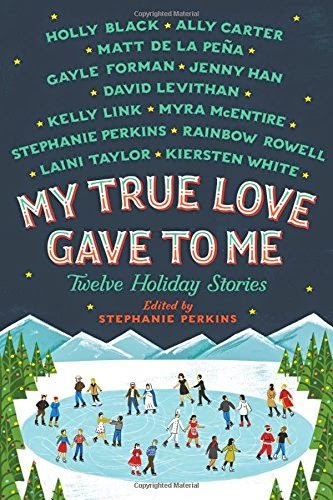 This is an anthology of holiday love stories from popular YA authors including: Rainbow Rowell, Kelly Link, Matt De La Pena, Jenny Han, Stephanie Perkins (who also compiled/edited), David Levithan, Holly Black, Gayle Forman, Myra McEntire, Kiersten White, Ally Carter, and Laini Taylor. Ranging from Hanukkah to Christmas, fantasy/folklore to contemporary/realistic, there's a little bit of everything for everyone. It seemed like the appropriate time of year to read this book! I have never reviewed an anthology before, and am now realizing how hard it is. Overall, sure, my rating is three stars, but that's just the average. There were some really, really fantastic stories. And some really weird, totally not-my-style stories. And the in-betweens. So I can honestly recommend this to most anyone that likes cheesy holiday romances because there is a really good chance at least one story will impress. In interest of space and time, I'll talk about the authors/stories that impressed me the most. My favorite favorite was Stephanie Perkins (who I haven't read before, but will now be seeking out more!) and her short called, "It's a Yuletide Miracle, Charlie Brown." It's impressive how quickly she builds a realistic romance between two complex characters. And how quickly I fell into it--I want more! Also (for same reasons), Gayle Forman's and Rainbow Rowell's stories are impressive. As for complexity in setting, concept, and character, the award goes to....(drum roll)... Laini Taylor. I haven't read her work before either, but her story (which wraps up the anthology, for obvious reasons) is above and beyond the cutesy contemporary romance. It's a intricate, folklore-ish, deep tale of admiration and love. Maybe not totally my style, but impressive nontheless. So give it a try. Read it however you want; I won't judge.